In 1896, when Penn State English professor Fred Lewis Pattee published the article “Is there an American Literature?” in the Chicago journal Dial, Pattee’s aim was to make the study of American literature a topic worthy of consideration as a separate field of study, not just a subset of British literature. He became the first instructor in the country to hold the title Professor of American Literature. 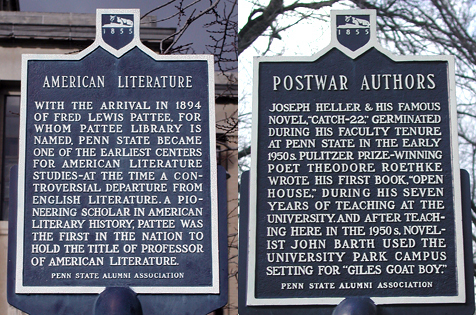 The historical marker located near the entrance of Pattee Library commemorates Penn State as one of the earliest centers for the study of American Literature. By his death in 1950, Pattee was a renowned American literary scholar, essayist, novelist, and poet. Today at Penn State, he is best remembered for the library bearing his name and as the man who penned the words to the Alma Mater. Just outside the southern entrance of Burrowes Building stands the Postwar Authors marker. Three literary giants were professors at Penn State at various times between 1936 and 1965. Theodore Roethke wrote Open House while an assistant professor of English; Joseph Heller began his novel Catch-22 while an instructor of English and after his Penn State career teaching English, John Barth used the University Park campus as a setting for Giles Goat-Boy. A bunch of the Penn State Research Communications team attended the National Association of Science Writers annual conference at Raleigh, N.C. last weekend. Unfortunately, for me, it was an abbreviated conference. With Sandy bearing down on the East Coast and with me terrified of being stuck in the Detroit airport — no offense Motor City! – I decided to bug out early.